WestJet has a promo code out today for '25% off' anywhere WestJet flies. However, it's only applicable to flights between November 6 and December 15th, 2017. Los Angeles, California (LAX) - $204 CAD roundtrip including taxes. Non-stop flights. Palm Springs, California (PSP) - $223 CAD roundtrip including taxes. Non-stop flights. Phoenix, Arizona (PHX) - $230 CAD roundtrip including taxes. Non-stop flights. Orlando, Florida (MCO) - $256 CAD roundtrip including taxes. 1-stop flights. New York City (LGA) - $310 CAD roundtrip including taxes. 1-stop flights. 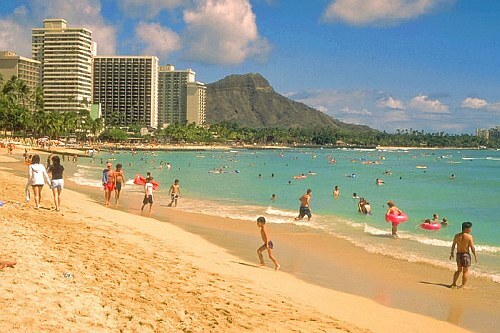 Honolulu, Hawaii (HNL) - $373 CAD roundtrip including taxes. Non-stop flights. 2. On the Google Flights page, click on the departure date box to open up the calendar view and browse for cheap date combinations in November and up to December 15th, 2017. 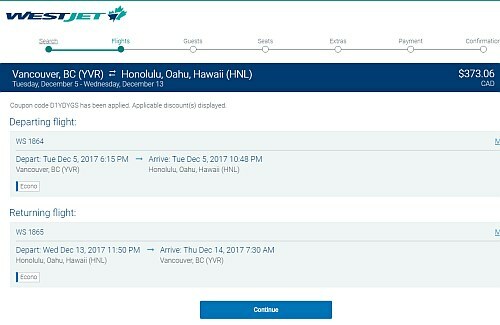 3 Responses to "Vancouver to Honolulu, Hawaii - $373 CAD roundtrip including taxes | non-stop flights"
FYI, westjet tickets to honolulu does not include seat prices ($25 each). If you're looking for around trip, you will need to factor in at least $50 more. Just booked from Sydney NS to Palm Springs. Again, thanks for the heads-up ! No problem Joanne, I'm glad it helped!